Dresden is one of the most beautiful German cities. It is also one of Europe’s greatest baroque cities, about 30 km north of the border with the Czech Republic. It stands majestically along the Elbe River. It has gained its importance in 1485 when it became the seat of The Wettin Dynasty. It is hard to believe that Dresden has been raised from the ashes and bears a few scars from its late 20th century trauma. Palaces glitter, garden bloom and the dome of the magnificently restored Frauenkirche again stands out above the skyline. With its wealth of museum, palaces and other tourist attraction, there are plenty of things to do in Dresden. Dresden is surrounded by a trio of fabulous castle as well as the porcelain town of Meissen. If you only have time for one castle, then Schloss Pillnitz has the best garden, Schloss Moritzburg has the most interesting interiors and Schloss Weesenstein the most romantic location. Riding bike or Seaway: there are so many people moving around on bicycle. It can be quite a handy way of transportation once you get familiar with the streets. If you are bit comfortable moving around the city then one must go in for the cycling ride along the Elbe. Saxon Food and Beer: there is a huge beer tradition in Saxony. Famous brands are Radeberger and Wernesgruner. Try some of the local dishes that are Pulverturm, a juicy suckling pig from the grill. Their side dish Potato dumpling is actually one of the regions specialties. Neustadt Nightlife: Dresden is a college town and this is the place where they all go out. If you are late after drinking beer you might enter the so-called Bermuda Triangle. But don’t worry there are restaurants which serve breakfast until 4 p.m. There are at least 150 pubs, bars and restaurants. 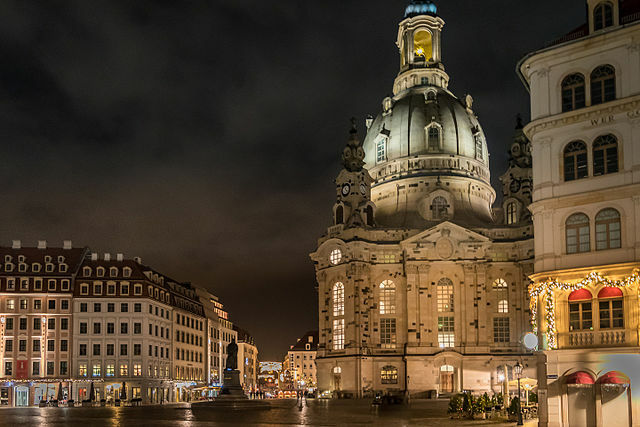 Frauenkirche Observation deck: It is Dresden’s most famous landmark. It is a great place to see the city from above. The views are just breathtaking. Cruise to Konigstein fortress: Dresden’s surroundings can be enjoyed from the waters, while cruising with a paddle steamer in the direction of Saxon Switzerland. Drive along the banks of the Elbe and see the three famous Elbe castle. Boat trip during the soft evening light: have a ride in the direction of Pillnitz and enjoy the sunset on board. Take a look at the imposing Elbe castle and admire the evening glow of Dresden’s old town. Experiences on water: there is a small range of great water based activities available in Saxon Switzerland. Several boat hire stations and tour operators are found along the river Elbe. A panoramic view of the majestic rock formations is a beautiful sight. Guided day trips in rubber dinghies: raft or Canadian canoes offer a lot of fun and space for comrades in arms. Impressive rock formation is a constant companion on tour as a guide in the accompanying motor boat. There is even a stop for a barbeque to recharge your batteries. Power boat trips are less tiring but just exciting: Up to 26 people can enjoy the exhilaration speed on a stretch between Meiben and Decin and experience the Elbe Sandstone Mountains at top speed. Saxon Switzerland National Park: Travel to Saxon Switzerland National park, only 30 kilometres southeast of Dresden. It is a wild landscape of soaring limestone pillars with views straight down to the Elbe. The most famous sight is the Bastei Bridge, a 76 meter high stone arched bridge that connects the rock formation and you can hike there or reach there by public transportation. One can travel to Saxon Switzerland by one of the world’s oldest paddle wheel steamboats in a most romantic way. The peak of happiness: Climbing the Elbe Sandstone Mountains is an indescribable experience. Besides the unique need of climbing in the heart of the Saxon Switzerland national park, it has distinct climbing rules and difficult scale that makes the summit experience so special for each climber. No one who has scaled a peak here will want to leave the magic of this climbing region. Do visit Dresden, a gracious and beautiful city to simply enjoy its many sights.